Ekso Bionics CEO Nathan Harding and veteran Billy Woods on the industrial, military and health benefits of the exoskeleton. Ekso Bionics is a company that designs and develops exoskeletons that can be used in the medical, military and industrial markets. 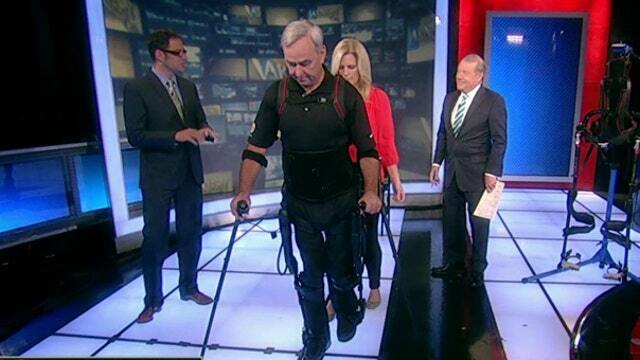 CEO Nathan Harding told FOX Business Networks’s Stuart Varney how the bionic suits work. “Essentially you take a robot and wrap it around a person and that’s what we call a human exoskeleton. It’s a machine that helps a person do something very directly,” he said. Harding says his medical unit is being used in 90 different centers around the world to help injured people walk. The company plans to announce an industrial partnership within the next 6 to 12 months. Although right now, those wearing the exoskeleton need a handler, Hardin says the company is “5 to 10 years away” from developing one that will enable the paralyzed to walk with no human assistance. Watch the video above to see how the Ekso Bionic exoskeleton works.